Victron might not be the cheapest manufacturer of inverters and solar chargers, but their stuff has a good reputation in the marine and off-grid communities. We built our van’s electrical system around their products. It’s nice to see that AM Solar has recently decided to use Victron components as the base for several of their RV install kits. That’s a big vote of confidence, because AM Solar tends to do their research before committing to stocking a product. The inverters are programmable and many of their settings can be changed. The inverters and solar chargers also have updateable firmware to take advantage of new operating modes. The color controller updates itself automatically over the internet, but the other components have to be done manually. Here’s how to do it. The one thing that this software really helps with is setting up lithium based battery systems and configuring the relays in the inverter, or using the advanced inverter features that run “assistants” – little programs that control charging or even feeding energy back to the grid. That level of programming is far beyond what the DIP switches can do, and it’s all but impossible without either knowing someone who owns the MK2 cable or a having a system that is attached to a Color Controller. There are two update options for the MultiPlus inverters. One is to buy the $70 USB-to-VE.Bus conversion cable (MK2-USB). The other option is to use the CCGX Color Controller and online VRM portal to do the update over the network or internet. OK, so the Color Controller is not exactly cheap either, but it’ll do a lot more for you than the conversion cable does. It uploads data to Victron’s VRM portal which is an online service where you can see usage statistics and also remotely control the CCGX. Once it’s installed, you can do some of your firmware updates and change all your settings remotely. Soon (1Q2017), Victron will be releasing a new version of their Controller with no screen called the Venus GX, which should make it quite a bit cheaper. You just connect to it remotely using your PC, which is exactly what you’d be doing for a settings update anyway. Venus GX prototype comparison to CCGX. It has a lot more input/output options. The GX firmware is open source, so if you have a Beagle Board or Raspberry Pi and an adventurous spirit, you can build your own networked controller for a Victron system. Victron products use three different communication protocols. VE.Bus, VE.Can and VE.Direct. The company has different software for updating products that use each of these communication protocols. 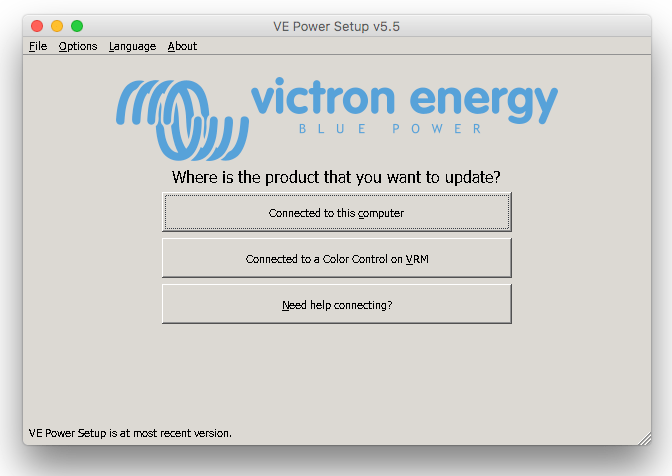 You can find the Victron software on their site. 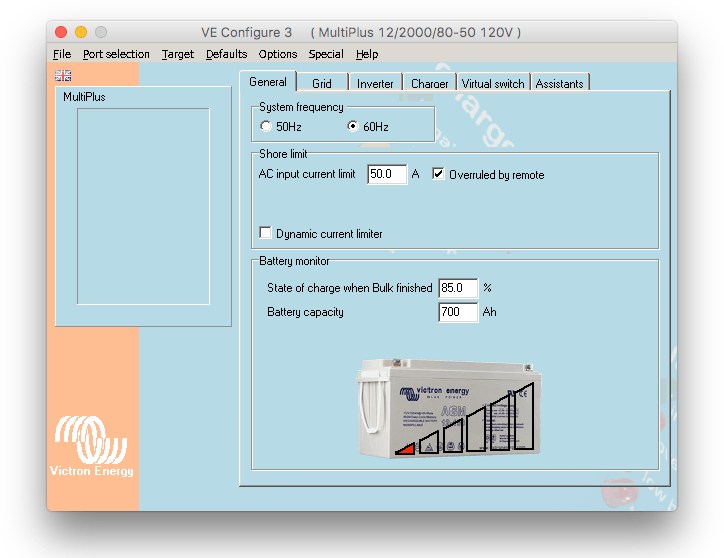 VE Configure tool for VE.Bus is the software for MultiPlus and Quattro inverters. VE Power Setup tool is used for VE.Can products like solar controllers, and for reading/writing the Multi and Quattro inverter settings remotely via the VRM Portal. 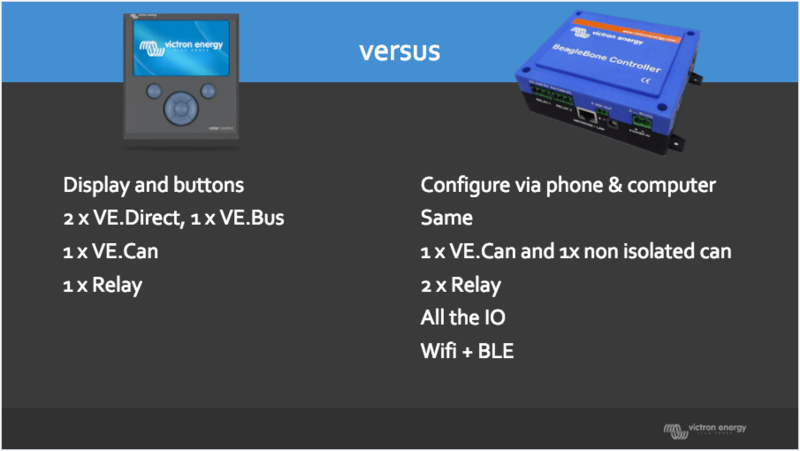 Victron Connect app will update VE.Direct products (BMV-700 battery monitor, some MPPT solar charge controllers) with a bluetooth dongle or USB-to-VE.Direct connector. If you’re running Windows, this software will install on anything from XP up. 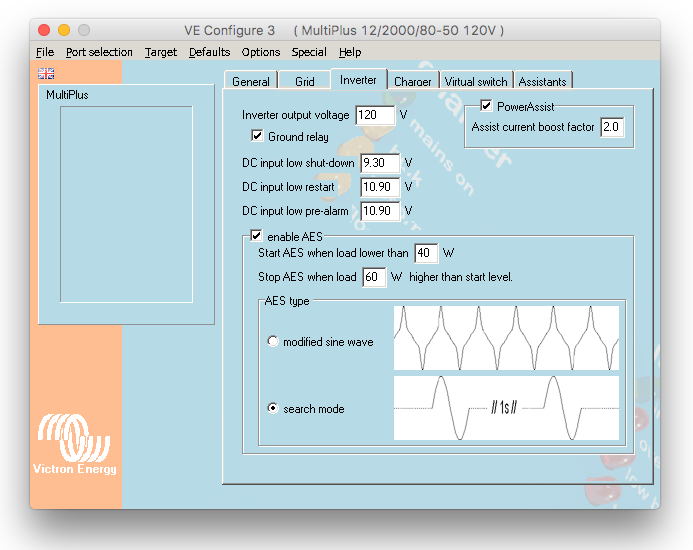 On a Mac, the Victron software works fine under WINE emulation. We wrote already about what WINE is and how to install it – see the appendix at the bottom of this post. Once you’ve installed WINE, just download the Victron software files and then open the installable executable files by right-clicking on them and choosing Open With… /Wine Devel. WINE will do the rest. You’ll see the install process screens and then the application itself will launch. If you’re making a physical connection, using the MK2 USB-to-device cable, you’ll need to find the correct slot on the device. For our MultiPlus Compact, it’s one of the two RJ45 cable connectors under the main panel. If the device is connected to other components using data cables, you first have to undo those data cables so the device is isolated. For instance, our MultiPlus is connected to the Color Control GX using a VE.Bus cable, so we have to unplug that before we start. 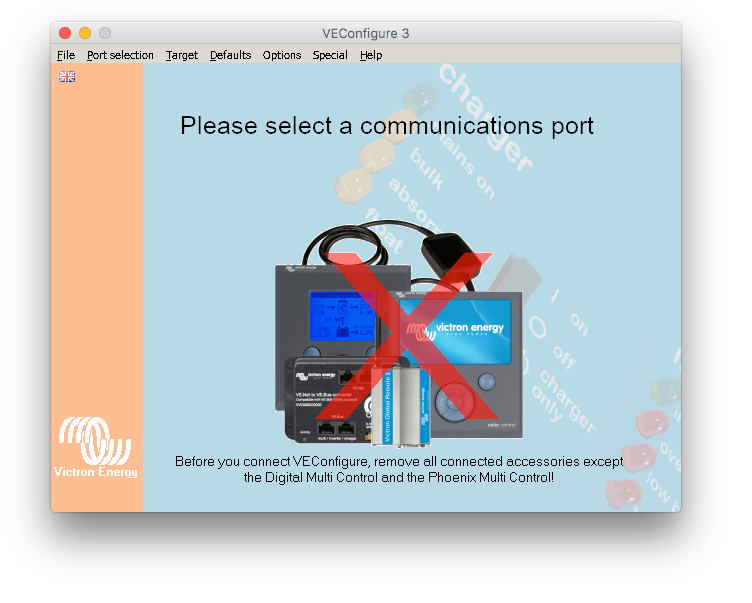 VE Configure software – heed this warning! Once you’ve selected the port, the software reads the device configuration and then lets you make the changes you need to before saving it back out to the device again. 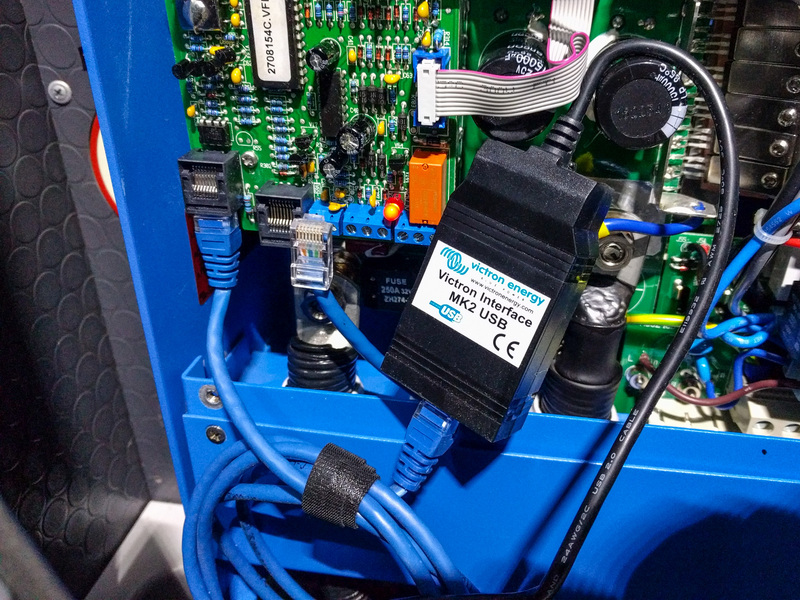 The direct connection is also the only way to do firmware updates on the MultiPlus inverters. Luckily, you don’t have to do this firmware update very often. In fact, you may never need to if you aren’t using any of the advanced features the device offers. 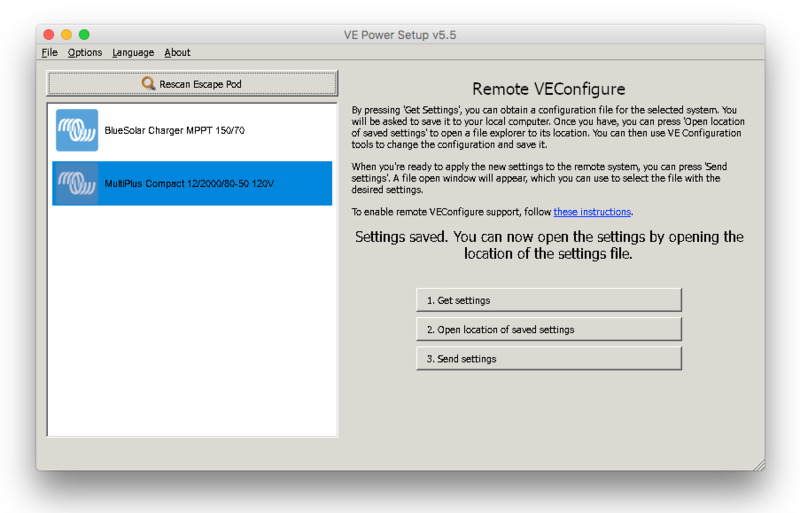 If you’re connecting remotely via the VE Power Setup tool, there’s no need to undo the data cables. In fact, you mustn’t – that’s how the Color Controller will read the information from the device, and send it across the internet to your PC. 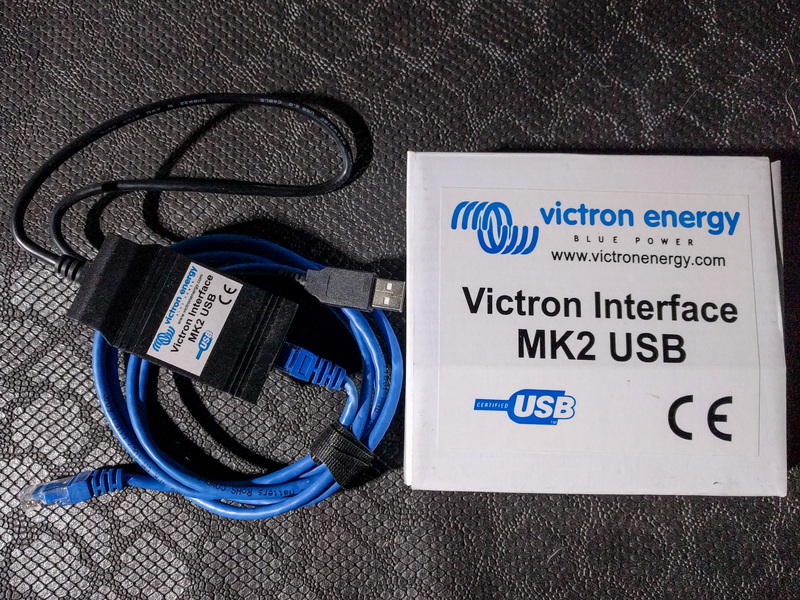 Victron have documented the connection process well. You can follow the instructions here. Basically, you log in to the VE Power Setup tool with your VRM Portal credentials, then you can read the configuration file from the inverter. Once you have a local copy of the configuration file, you open it in the VE Configure tool, make the changes you want, and save it back to your PC. Then, you use theVE Power Setup tool to send the new configuration file back over the internet to the inverter. The VE Power Setup tool can also apply firmware updates for solar chargers, but not for the inverters. 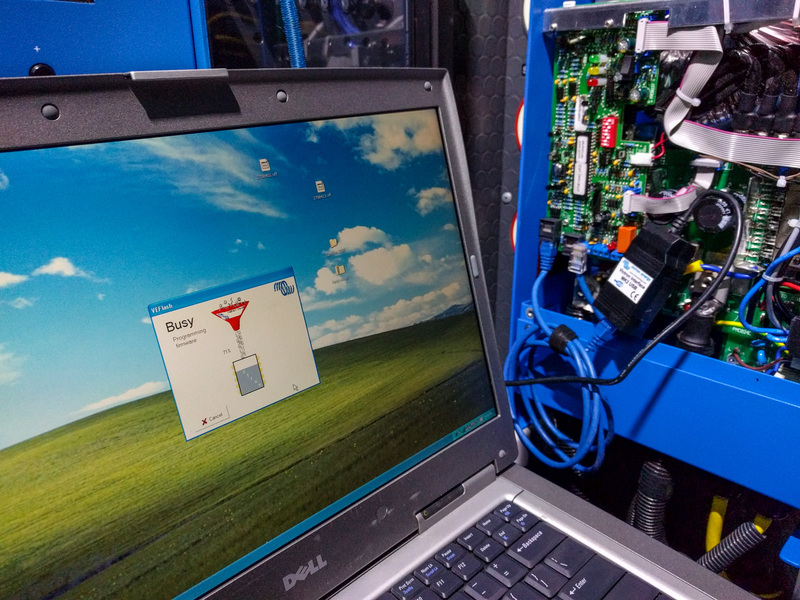 Unfortunately, inverter firmware updates still have to be done by plugging directly into the device. The process of doing the updates has several steps, but it is not difficult. 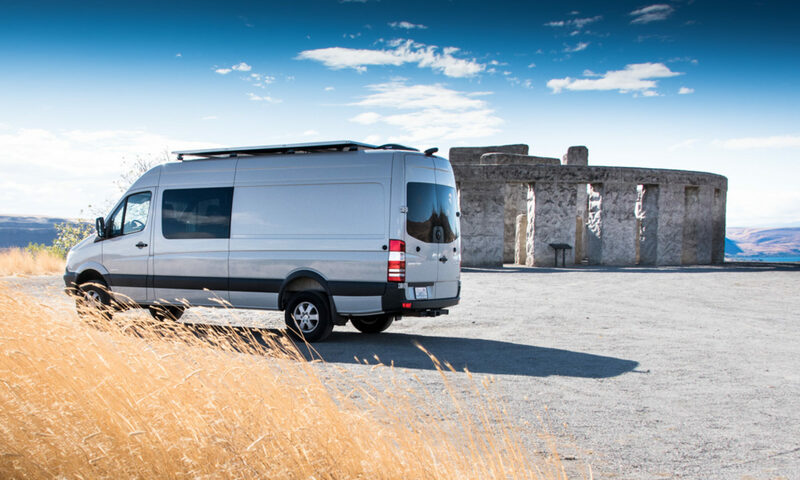 The fact that you can do most updates remotely isn’t such a big deal for a van-based installation compared to an off-grid setup on the side of a mountain miles from civilization. However, it’s nice to be able to view settings and apply updates from the comfort of a desktop computer rather than crawling around in the storage area of the van plugging cables in on a cold, rainy afternoon.